WAGRAM, NC , Nov. 27, 2018 /CNW Telbec/ - Cascades Inc. (TSX: CAS), a leader in the recovery and manufacturing of green packaging and tissue products, is pleased to announce an investment of US$58 million in its Wagram plant in North Carolina that will modernize the plant and add new tissue converting equipment. These project investments are part of the capital expenditure envelope previously announced by the Company. The Wagram plant produces hand towels, paper towels, bathroom tissue and napkins marketed under the Cascades PRO brand, which serves the Away-from-Home markets. The plant will be largely supplied by the Cascades tissue plant located 30 miles away, in Rockingham . Upon completion of the project, the Wagram plant converting capacity will increase from 5.3 million cases per year to close to 15 million cases per year, resulting in a global capacity addition of 3 million cases for the Group. Cascades would like to mention that this project has been made possible in part by the cooperation and financial support of governments and economic development organizations of North Carolina and Scotland County . Founded in 1964, Cascades offers sustainable, innovative and value-added solutions for packaging, hygiene and recovery needs. The company employs 11,000 women and men, who work in over 90 production units in North America and Europe . With its management philosophy, half a century of experience in recycling, and continuous efforts in research and development as driving forces, Cascades continues to deliver the innovative products that customers have come to rely on, while contributing to the well-being of people, communities and the entire planet. 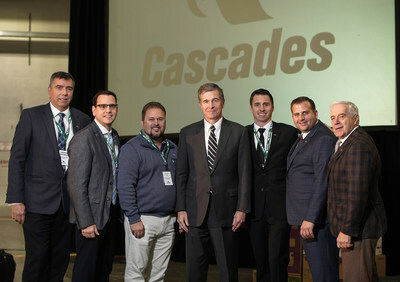 Cascades' shares trade on the Toronto Stock Exchange under the ticker symbol CAS.